Jennifer Lawrence has scooped her first major win of 2014’s awards season, taking home the accolade for Best Supporting Actress In A Motion Picture for her role in American Hustle. Dressed in an epic white Christian Dior Couture gown with black detailing, and showing off minimal accessories with her immaculate pixie crop, Hollywood’s hottest actress of the moment well and truly stole the spotlight. But it wasn’t just her golden gong which is making headlines this morning. 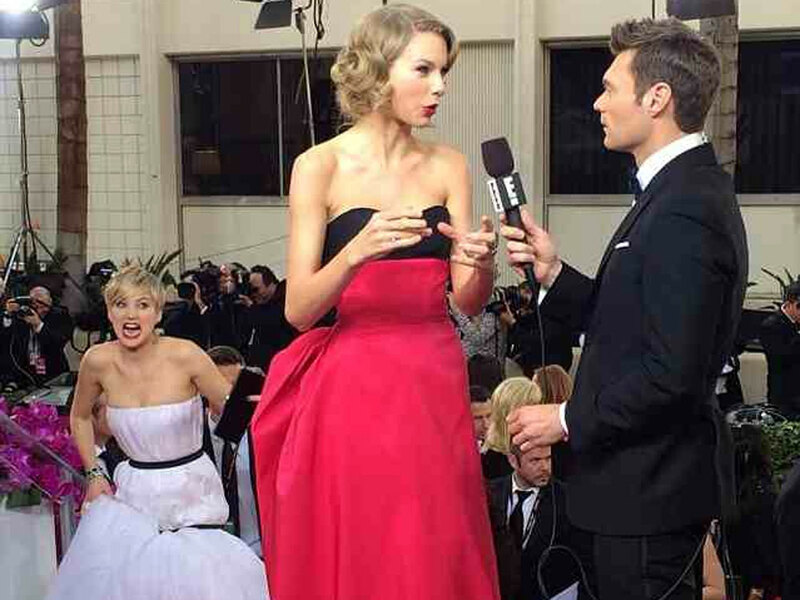 One amazing picture of the young actress is circulating online, which shows Jennifer photo bombing Taylor Swift during an interview with Ryan Seacrest. As she climbed the steps on the red carpet up to the E! Online podium, (without falling, we might add), Jen pulled a face at the camera in a bid to distract Taylor, pretending to push her over. Amazing. She quipped at Taylor: ‘I was going to come in and push you down the stairs,’ before giving her famous friend a hug. Jen then caused more red carpet drama when she dropped her diamond bracelet during an interview with the E! Online host. The 2014 Golden Globe Awards, held in Beverly Hills last night, saw American Hustle take home three wins, while Breaking Bad took home two. The A-list arrivals were delayed at the start of the evening, when a burst water pipe almost completely destroyed the red carpet. Fire crews were called to deal with the issue as organisers panicked about the stars and potentially damaging their borrowed couture gowns. Jennifer spent the evening taking selfies at her table and snuggling with her on/off boyfriend, British actor Nicholas Hoult. While she didn’t pose for photographs on the red carpet with her man, she was seen giving him kiss before taking her moment in the spotlight to collect her gong. We can always rely on Jennifer Lawrence to bring the entertainment to a black tie bash. We’ll bring you all the news and pictures from the ceremony as they land. Congrats, Jen!